La terre avant le deluge. 5th ed. Paris: Libraire de L. Hachette, 1866. In the fifth edition of his popular book, Figuier replaced the “Adam-and-Eve”-like representation of the “apparition de l’homme” (see item 20) with this new wood engraving. 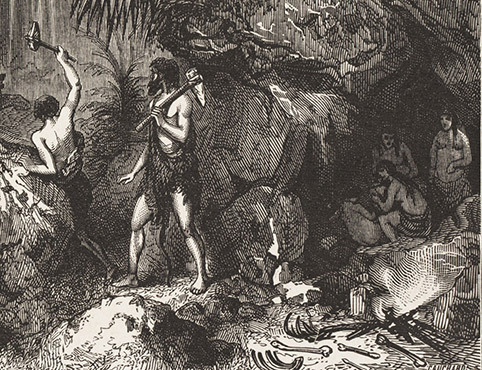 It has the same caption, but now these early humans are living in caves, wielding stone tools, and contemplating a landscape filled with Irish elk, wooly mammoths, rhinoceroses, and hyenas. It took Figuier only three years to accept the idea of human antiquity. 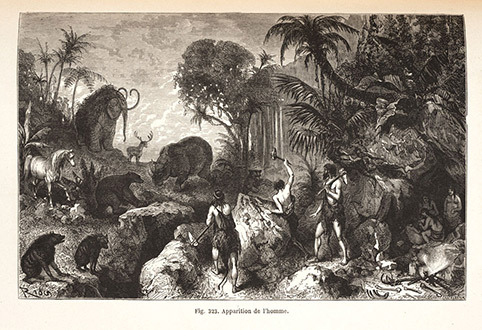 The illustrations in all the editions of Figuier’s book were drawn by Edouard Riou (1833-1900), who also provided the wood engravings for Jules Verne’s Voyage au centre de la Terre (Journey to the Center of the Earth, 1864).